We have talked a little about how to make money on the internet. Obviously one of the main ways to do this is via your own website – whether it is your own shop selling products, or a website about one of your interests, which uses advertising to generate income. But first of all, you need the website. Here are the initial basics of setting up your own site – it's not as difficult as you might think! The starting point for creating a website is the design stage. At this point it’s important to know what you want from your website and how you want it to look. Designing a website doesn’t necessarily require the use of a computer, but it does require careful research and planning. The following section explains how this should be done. Make money: This could be the primary objective, but the website needs more elements to ensure people visit it and in turn make money for you. Attract particular visitors: An audience is essential, especially an audience with a specific interest that can make money for you. One of the most effective ways to design a website is to look at what your competitors are offering and see if you can do better. Don’t just stick to websites in your own country; search worldwide through the various search engines from Google and Yahoo! Also, look at other industries that work in the same way as the website you plan to create. For instance, if you plan to create a website covering the renovation of a house, look at websites that cover the restoration of cars. Websites with multiple pages are often easier to design on pieces of paper. This method allows you to make a list of subjects and aspects you want to cover, then write them into the relevant pieces of paper that represent the different pages of the website. Most designers use a hierarchical structure for designing web pages, with an introduction or home page at the top, then sub-pages below and, if necessary, more pages below these. 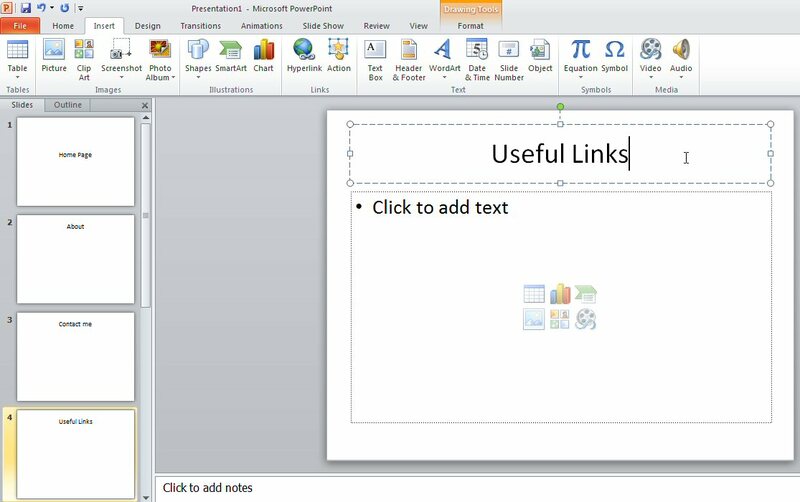 Also invaluable, Microsoft PowerPoint is a presentation package that can be used for designing the pages of a website. Look at lots of colour schemes on different websites to help you decide which ones work and which ones look unsuitable. 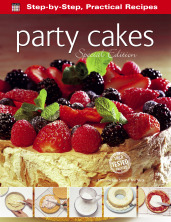 Experiment with different colours, fonts and styles using word-processing or DTP software. This will help to settle upon a particular set of colours, fonts and other styles that can be applied throughout your website. Important: avoid using too many colours and fonts in a website. A website can be created in a number of ways, ranging from writing your own HTML code using a simple text editor to using an online creation package with web space and a domain name provided. The following section explains what options are available and how a website should be constructed. Domain name: A suitable website address. Webspace: A website-hosting service or a server to store the website’s files. Software: A program of some description is required to construct the website, whether it’s online or on your computer. Email: A message-forwarding service can provide multiple email addresses that contain your website address (for example, sales@robhawkins.co.uk), which are redirected to a specific email account. HTML editor: If you are familiar with writing in hypertext markup language (HTML for short), you can produce exactly what you need using something as simple as a text editor, such as Microsoft Notepad. Web design software: Serif’s WebPlus, Adobe’s Dreamweaver and Microsoft’s Frontpage are some of the web design programs that can help create an entire website. Some software is free to use, such as WordPress, whereas others are offered as trial versions with full versions ranging from a few pounds or dollars to a few hundred. Other programs: Word processors including Microsoft Word can export a file as a web page, allowing it to be used in a website. This is an easier approach to creating a website, especially if you are familiar with such a program, but the results may not be as good as using a dedicated program. Online design: There are lots of deals offering the online creation of a website, often for free (although advertising is usually included). If you are new to web design software, then a free online website may help to make you more familiar with what’s required. The following step-by-step guide outlines what’s involved in making your own website with an online web design program provided by www.moonfruit.com. Visit www.moonfruit.com: Open your web browser and go to Moonfruit’s home page, where you will see a number of website designs on the screen. First, log in or register by clicking on the ‘Login’ button near the top-right corner of the screen. You will need to decide upon a username and password and enter details including your email address. After registering, you can choose to create a website – click on ‘Add site’. Pick a design: On Moonfruit’s home page, you’ll see a variety of website designs. Click on the arrows toflick through the different ones and when you find one you like, select it. The design will pop up in the centre of the screen. Select ‘Click to build’ to proceed. Name and address: After selecting a website design, you’ll need to enter a name for the site and an address. The site address will include ‘.moonfruit.com’ at the end. So if you use an address such as ‘FrenchGite’, the full address will be www.frenchgite.moonfruit.com. After entering the site name and address, click on ‘Launch my site’ (if the address is already used, you’ll have to enter another one). 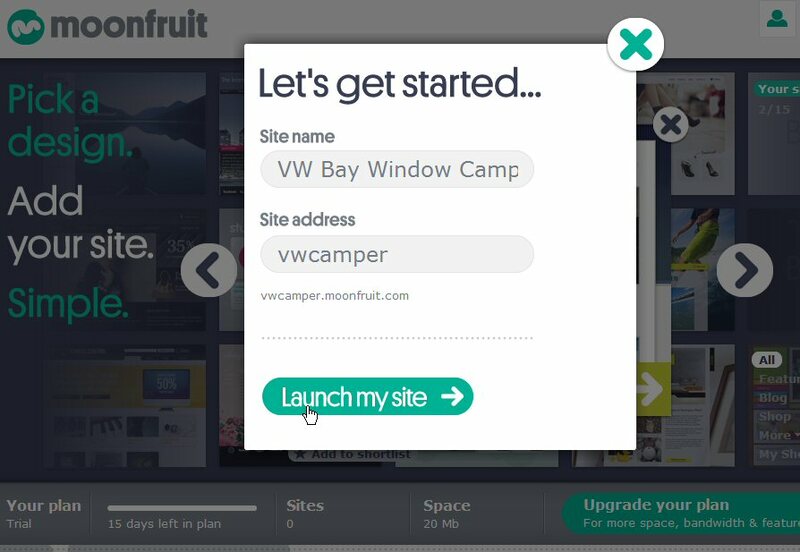 Keep for free: Your Moonfruit site is only available as a free trial for 15 days, but can be converted to either a paid-for website with more features, or a free website with Moonfruit’s own advertising and limited features (sufficient to get you started). A message box will prompt you and guide you through choosing a paid package or converting to free (the site has to be updated every six months to remain free). 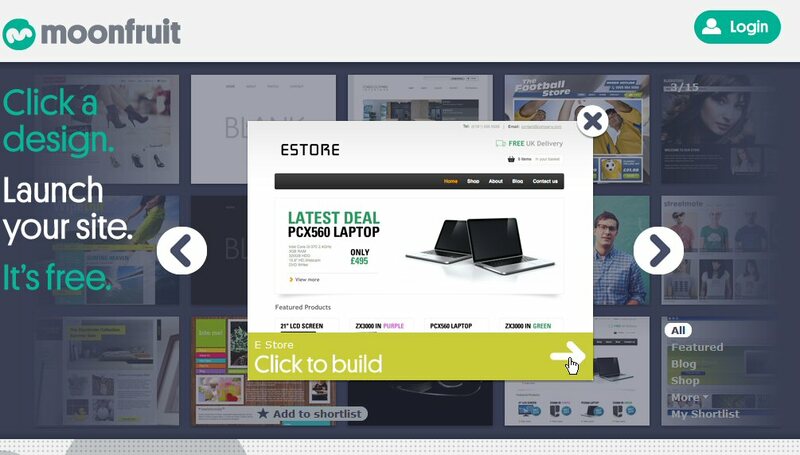 Add content: The online sitebuilder screen will display the web page design you chose. It can be edited by double-clicking inside text and changing it. Images and text boxes can be removed by selecting them and pressing delete on the keyboard. Other pages for your website can be opened and edited by selecting the appropriate navigation buttons. 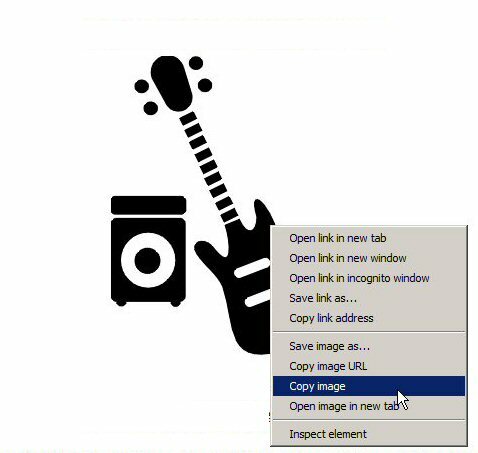 Insert your own images: Click on the Insert button near the top of the screen and a list of objects to insert will appear down the left side of the screen. Click on ‘Image’ on the left side of the screen and a File Manager window will appear. Select the images folder on the left, then click on ‘Upload’ to locate and add your own images from your computer. After uploading an image, select it and click on the ‘Use this’ button. 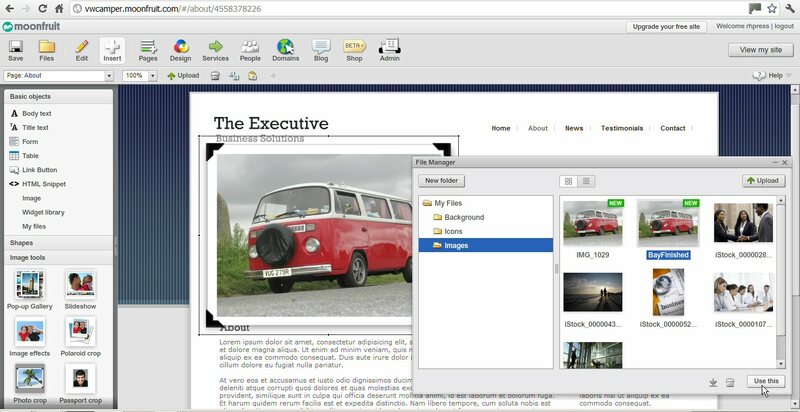 You can then close the File Manager and move and resize your image on the web page. Check and publish: Your website can be instantly viewed online and is also available for anyone else to look at. Either click on the relevant button on screen, or use your web browser to visit your website address (the one ending ‘.moonfruit.com’). Your website can be further modified by logging into your account. Other features can be added including links to Facebook and Twitter. An easy-to-remember and relevant website address (domain name) is essential, but relatively easy to find and acquire. Domain name search sites including www.nameboy.com, www.123-reg.com, www.checkdomain.com and www.whois.net can check whether a domain name is already owned. If it isn’t, you can shop around for a deal to purchase the name along with any web hosting packages and online web design services (if required). If you haven’t got a domain name and web space to host a website and are unfamiliar with HTML or web design software, it may be cost effective to opt for a package that includes all of these features with an annual or monthly payment. Web hosting services can provide all of this and there are plenty of them to be found through search engines such as Google and Yahoo! However, it’s worthwhile speaking with them and making sure you’re confident they are providing the correct advice and guidance. Look for web hosting services that are in your country and possibly local to you. Your internet service provider at home may provide some online space, which can be used to host a website. Many free website domain names are available, which include the provider’s business name in the address or feature advertising with your website. There’s a vast assortment of content available that can be added to a website, some of which is free to use. The following section outlines what you need to consider in the way of content and where you can access free material that helps to make your website look professional. About you: It always helps to include a short section outlining who you are and what you do. If possible, include a personal angle, such as a photograph of yourself. Legal paragraphs: Include any relevant information on copyright of your website’s content and legal disclaimers concerning the purchase of products and delivery. Look at other people’s websites to see what is required. Purchase protection: Display the methods of payment you accept and if there are any security measures, promote this to reassure customers the website is genuine (for example, SSL or Verified by Visa). Contact details: A website needs to offer some method of communication to help deal with enquiries, purchases and complaints. Contact details: Don’t display your contact details as text because the information can be copied and used for sales calls. Instead, create an image for the contact details and add this to your website. Online forms: If you have any online forms for customers to submit questions, include a validation field where the submitter has to type in some words that are displayed as an image. This is difficult for automated programs to read and helps to avoid scams. Register first: Restrict access to your website unless visitors register and log in. Whilst this may deter some customers, it helps provide a level of security, which may reassure customers who want to make online purchases. Make sure your content is clear and easy to understand. Avoid over-filling pages to make them difficult to read. Many websites are cluttered with affiliate advertising, search boxes and additional images, leaving very little space for the main content. Free clipart on your computer: Programs such as Microsoft Office and dedicated drawing programs such as CorelDraw include free-to-use clipart, which can be included in a website. Free clipart and photos online: Search for ‘free clipart for websites’ using a search engine such as Google or Yahoo! and you’ll find an abundance of websites offering free images. Free animation: Animated images help to bring a website to life and can easily be incorporated without slowing down the rate at which the page loads. Animated GIFs and other types of files can be found at a wide range of free clipart websites (see above). Other free stuff: Banners, sidebars, lines and buttons can all be found on free clipart websites. Online website builders: If you use an online service to construct your website, this will probably include images and other features that can be included in your website for free. Hot Tip: Don’t copy images from other people’s websites without their permission. It could result in a very expensive legal claim. That's plenty to get you started with your own website. As you gain more experience, you may want to include some video on your site – a particularly effective element on a website. 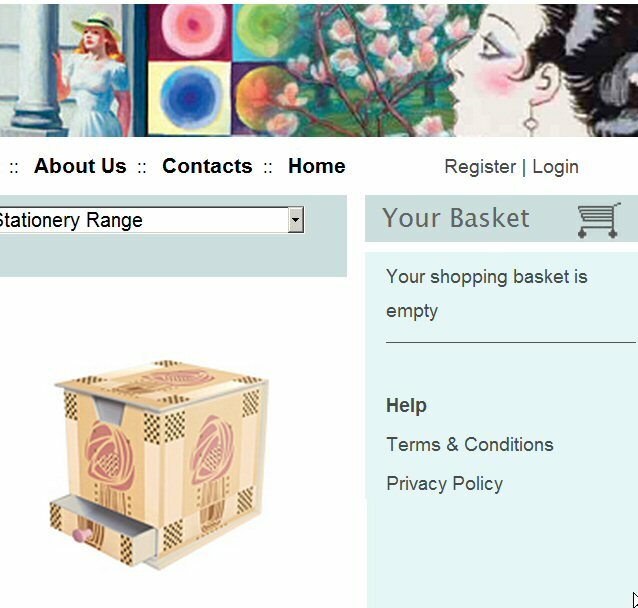 Or add a forum – useful for a wide range of purposes, form gathering opinions on your products to providing online help. Other useful features include guestbooks, news, polls, search facilities, calendars, social network links, live chat, and – a particularly effective internet marketing tool – a blog. Vist Tom Jones' straightforward guide to creating your own website. Upload videos easily using specialist services such as these. Set up a blog online with a free service such as this. This post is based on an extract from our bestselling book, How to Make Money on the Internet by Rob Hawkins (ISBN: 9780857753908) – where you can find more on the above and further help on how to get the best out of your website.